For those that truly know me, know of my obsession with bananas and peanutbutter. The interesting part is that I never ate peanutbutter and jelly sandwiches at a young age. It wasn’t until I was in my Junior year of high school that I truly started to eat the delectable sandwich. This was driven by two focused areas at that time of my life, well maybe 3 areas – eating healthier, saving money and time. That was some 13-14 years ago and if it wasn’t for peanutbutter, as well as oats & bananas, I really don’t know if I’d be where I am today! I know, crazy, right? How can this be? Well, I’ll break into the cost and how this has been possible for me, especially because food takes up approximately 20% of my monthly expenditure. The cost of a 40 ounce jar of peanutbutter at Aldi cost $2.89. The suggestive serving size is 40, but I’ll say I do at least 50% more per serving than normal (can’t get enough of it), therefore, I’d conclude that this jar holds 30 servings for me. The cost per serving for me is $0.0963 or $0.10 rounded. Bananas are typically $0.44 per pound for me lately. When buying 2 pounds of bananas, this can be around 6-7 bananas or $0.135 per banana. This varies depending on the size, but the average weight per medium-sized bananas comes in at 4-5 ounces. Sometimes a banana to me can be a dessert and at only $0.135 per pop, I am all over it! Oats, also, only cost $2.39 at Aldi as well and is the two pound & ten ounce container (42 ounces). You have to maximize your efforts here! The servings per container, which I would state I stick with what’s prescribed, is 30 servings. The cost per serving for me is $0.0796 or $0.08 rounded. Oatmeal with Peanutbutter and a Banana – It’s true. These three ingredients or items combine to form one powerful meal. 1 serving of oatmeal has 150 calories, 2.5 grams of fat, 28 grams of carbs, 4 grams fiber & 5 grams protein. 1 normal serving of peanutbutter for me is 285 calories, 22.5 grams of fat, 10.5 grams of carbs, 3 grams fiber & 10.5 grams protein. 1 medium sized banana has 105 calories, no fat, 27 grams of carbs, 3 grams fiber & 1 gram protein. When I combine these three, the total nutrition comes to 540 calories, 25 grams of fat (19.25 unsaturated), 65.5 grams of carbs, 10 grams of fiber & 16.5 grams of protein. Talk about a mean, powerful bowl of energy here! I typically add these together, with water and cook in the microwave for between 60-70 seconds. I will either have this for breakfast and/or for lunch; because to me, it’s damn delicious and provides the energy that I need for multiple hours, keeping me full from the fiber and focused. Due to taking around two minutes for total preparation (cutting the banana takes the longest at 30-45 seconds), this allows me to make the most out of my lunch hour, each and every day. Oh and cannot be the cost of $0.32 for my lunch! Just typing that out makes me smile and nod my head baby! Banana with Peanutbutter Topping – Another one of my favorites. It will be 2:30/3:00 PM in the office and a craving, small meal internal clock dings. I will open the banana, place on plate and place my servings on peanutbutter over the top. This typically takes me about 30 seconds to a minute to complete this preparation, as I don’t cut the banana into slices (literally, just slicing each bite with a fork). Further, this comes in at around 390 calories, containing over 10 grams of protein and 6 grams of fiber. This is a fairly expensive snack at $0.24… budget breaker? I am kidding. No chance that this is a very inexpensive snack that will fuel your craving & metabolism in a healthy & cost efficient way. I know I continue to beat this saying to a pulp, but, every dollar counts in the journey to financial freedom! 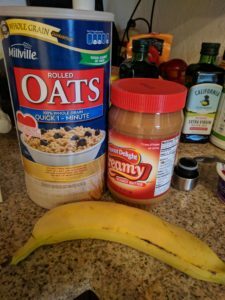 Banana-less Oatmeal – Don’t have any bananas left? No problem. Luckily my jar of peanutbutter and container/tin of oats lasts me almost the same amount of time. This cuts down the time by a little bit, not having to slice & add the banana. Further, the nutrition comes in at around 435 calories & over 15 grams of protein, with 38 grams of carbs and 7 grams of fiber. Lastly, this only costs me around $0.18 per occasion. During a given week, I will have these at least 6 times (sometimes I do end up eating this twice per day and some days I may never have it). Why do I want to eat this? It’s damn delicious! I am dead serious. My favorite above is the first option, once the peanutbutter is warm/silky, it’s phenomenal. Also, eating this around 6 times per week on the maximum end is LESS THAN $2.00!!! I’ll say that again, THIS COSTS ME LESS THAN TWO DOLLARS! Do you want to save money? Look at your food budget and aim to introduce one of these meals above to your diet and financial statement! I promise you will see results in a matter of one week. Dividend Dynasty recently talked about the brown bag lunch and Jason Fieber talked about what oatmeal & brown sugar means to him with a twist; and it was my turn to show the technical impact of my eating habit! I promise you this isn’t a bland lunch option. I also promise you that you will save money. I can also state that you will feel full for an extended period of time from this meal, purely because of the nutritional facts. Maintaining a steady helping of the servings above allows me to stay at or above the 60% savings rate on a monthly basis. On top of that – I do not feel like this puts me in a position of missing out on anything, as these meals are typically when the other option is to eat out with co-workers for lunch (not what I typically want to do, when I see them 50-60 hours per week already) or to go out to grab food from a restaurant by myself, etc..
What do you think of the concoctions above? Do you eat peanutbutter, bananas and/or oats on a regular basis? If so, are you able to second the amount of money and time one can save? Do you love the taste? Actually, this brings up an even better question – do you have other lower priced meals that are quick, healthy and delicious? Please share those, as I believe it won’t just benefit me, but hopefully will benefit the community! Also, if you have other variations of using these delicious items above – post them below. Thanks again everyone, save money and invest often. 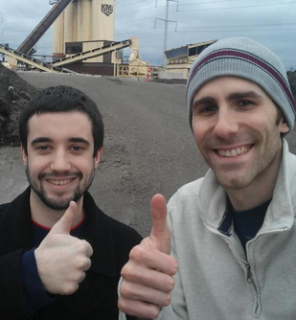 This entry was posted in Frugal Living and tagged budget, Every Dollar Counts, Financial freedom, frugality. Bookmark the permalink. Well oats are my breakfast so I recognize that. Even though your recipe contains a lot of the daily needs in fats, carbs and proteins I wouldn’t recommend it as a permanent daily only source of food. The body (& mind) craves more than just this. Thanks for the post! I agree, good to have once a day, fuels the body, but definitely more to eat than just this, haha. I eat probably 5-6 small meals/snacks a day, and this has been one huge staple that kick starts my morning or fuels my afternoon. Love it. I cannot remember the last time I went out for lunch. 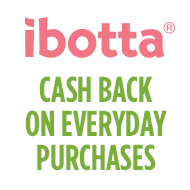 It’s good because it saves me money and my health (no junk food). It was difficult when we started out, but now it is just routine. Exactly, healthier, saving money and… saving time! Routine for sure, and if I go a few days without having this small little meal, I don’t feel right!! Appreciate the comment. Damn, no!!! Not the allergy related to peanuts, agh, so sorry to hear!! How is potato bread? I never really have had that before – how much is it per pound/loaf? Of course and hope you ha a nice thanksgiving as well! Nice job getting the sale. How long does potato bread last?? These three foods have a very high calorie-to-dollar ratio and very high nutrition-to-dollar ratio as well. 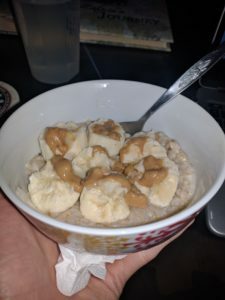 Add in the time Oats, PB and Bananas are definitely a trifecta of awesomeness- especially compared to any restaurant meal! Sardines, Eggs, Potatoes, Rice, and Black Beans! Maybe not as tasty as a PB topped banana… but a mashed avocado with sardines mixed in atop some crispy toast is my go-to frugal dinner when I’m in a hurry! One thing I have never really ate were sardines. How would you rate them on a 1-10 taste scale? Do you add pepper and/or anything else to them? I love avocado, and could eat one a day if I could. Black beans are also a top notch staple at the house, as well as sweet potatoes as of late – I can get a back of 6-7 sweet potatoes for less than $1.50 it’s amazing. I planned on writing something similar a few weeks ago … but with a little different flavor. I always bring my lunch to work (unless work is providing ME lunch). Recently I loaded up on Ramen, which I supplement with a piece of fruit or vegetables (like carrots). Plus I keep a big bag of almonds at my desk, if I get hungry I grab a handful. That keeps the expenses down at work. At home, I cook 80% of the nights always with a flare for leftovers and keeping costs down (but being a little fancy sometimes too). Of particular note, if you like healthy grains (similar to oats) that are packed with fiber and nutrients I suggest these: barley, wheat bulgur, wheat berries, farro, etc. Usually you can find these for less than $1 per pound, and they are great for a wide variety of food. Overall my food typically costs less than $5 for me a day, including all snacks. Nice! I have hard amazing things about bulgar & farro. Wheat berries are gaining popularity as well. I’ll have to look them up next time I am at the store, been a huge fan of flaxseeds lately, as well, to add to oatmeal, cereals and yogurts. Cooking dinner at home, typically the most expensive meal, is the way to go. It’s funny – you go to a restaurant and typically it’s in order of least to most costly: Breakfast, Lunch, Dinner. Hilarious. Appreciate the comment and let’s keep saving! Nice! The toasted sandwich I am sure melts the peanutbutter just right. Interesting on the regular butter! I assume you do the butter before the peanutbutter? Or is it one side butter and the other peanutbutter? Go eat and save money! I have been slacking big time in this department over the year. As things get busier it is easy to lose track in this category. Budget aside those are all healthy staples to have. I just had a big bowl of oatmeal with fruit yesterday morning ahead of the thanksgiving feast and it was so good. Going to jump back on this train good timing for the article thanks. Hell yes and that’s what I love to hear. Met up with friends this morning and had oatmeal & fruit, I was full for approximately 5 hours until I ate again – and this included raking leaves, cleaning bathrooms & going for a 2.5 mile run. Energy, nutrition and savings, perfect recipe, right?! To each his own Lanny. I for one am not a fan of oatmeals. I tried it because it’s healthy and good especially if you’re trying to build muscle. But, I hate the taste of it. I do like peanut butter, but never had it with bananas before. But, I think it’s a great way to save money. As you know, my food budget is atrocious. Although, I’ve been eating a lot of Ramen noodles recently. Good post. OOph, sorry to hear you are not a fan! Try to mix the ingredients together to improve the taste and punch that oatmeal gives you. Excited to hear about your ramen noodle bender, definitely should save you money, haha! Good post, I tried this meal today, definitely great for the money! Maybe I’ll have to go to Aldi next time, the prices I paid weren’t nearly as good. What did you think? Did you enjoy it? Did you cook it on high in the microwave for 65 seconds? Let me know how you prepared it! And YES GO TO ALDI!!! Only 2/7 family members in the DFG household like oatmeal (includes me). So it does save us money but not as much as you. Still I love Aldi’s and don’t know why people shop elsewhere (except for specialty stuff). I’m actually a huge fan of the peanut butter/banana/oats trifecta. I mostly eat mine as a shake: I also add milk and a lot of raw spinach. You can peel bananas and freeze them in a ziploc bag as well, which are great for shakes. That’s a good way to not worry about buying too many bananas – if they get old, peel them and freeze them for a shake later.